For the reception and processing of the GPS signal, as well as for brightness and temperature measurement. 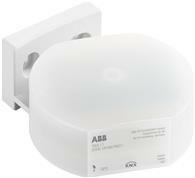 The sensor measures the brightness and outside temperature and sends them on the KNX bus. Likewise the time, date and geographical coordinates are send to the KNX bus. Additionally the sunrise and sunset times are also send to the bus. With integrated Bus Coupler.